See over there on the left (or down the bottom on yer mobile)? 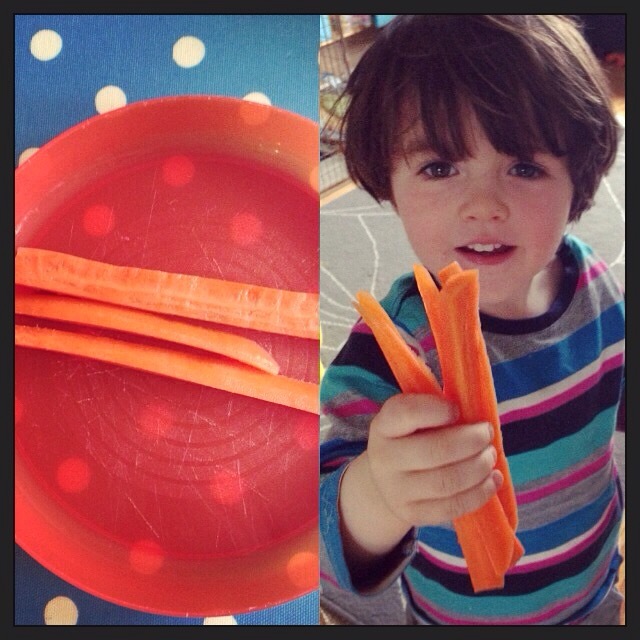 Yeah that, the Irish Parenting Blog Awards! I’ve gotten a couple of nominations, and excitement is building in the IPB community. I don’t get out much and now I’ve a glitzy awards ceremony to look forward to. Eep! We decided on curry. This particular one is a real treat meal, but still lacks the guilt of a takeaway. I dunno about you but I love curry. I have eight million herbs and spices but sometimes I want some shortcuts. I don’t like using jars so the compromise option for me is to buy a spice mix from Green Saffron (another great Irish company). As usual, the packet recipe is for a meaty curry, so I adapted it to suit us. 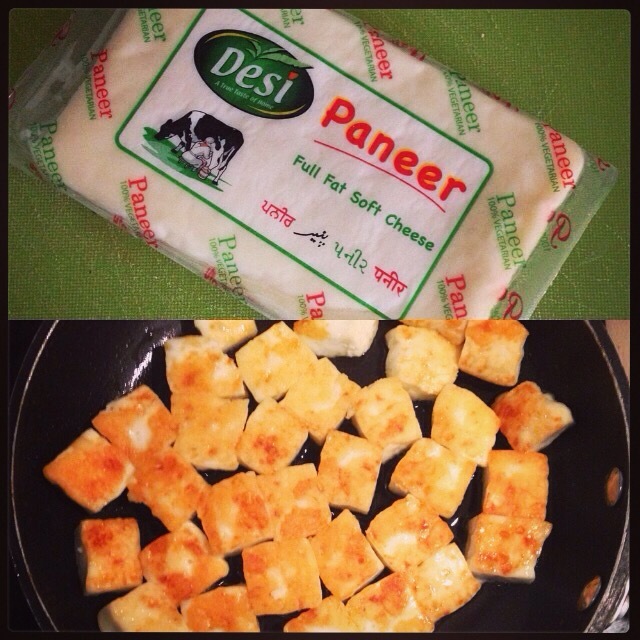 Jamie Oliver has a paneer recipe. But it comes in a pack too! Heat 1.5 tbsp coconut oil in a large pan. Sweat the onions, garlic & ginger with the lid on til they’re all nice and soft. Back to your oniony mix. Add half the spice mix, and stir for a minute or so. Yes! Good news, I find half of the 25g is enough to feed two adults and two kids, so you can get two full meals out of one packet. Add your tomatoes and simmer for ten minutes. While they simmer away, chop up your veggies nice and small. 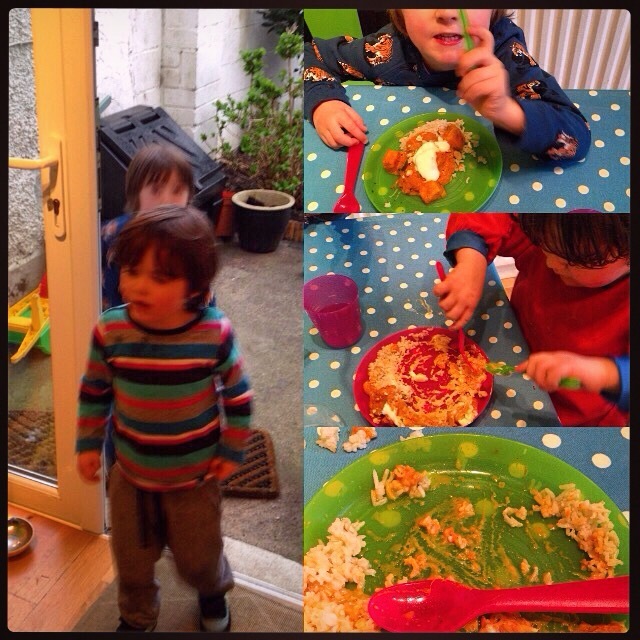 You want them to cook through in the sauce and you don’t necessarily want the kids to notice huge chunks of veg. 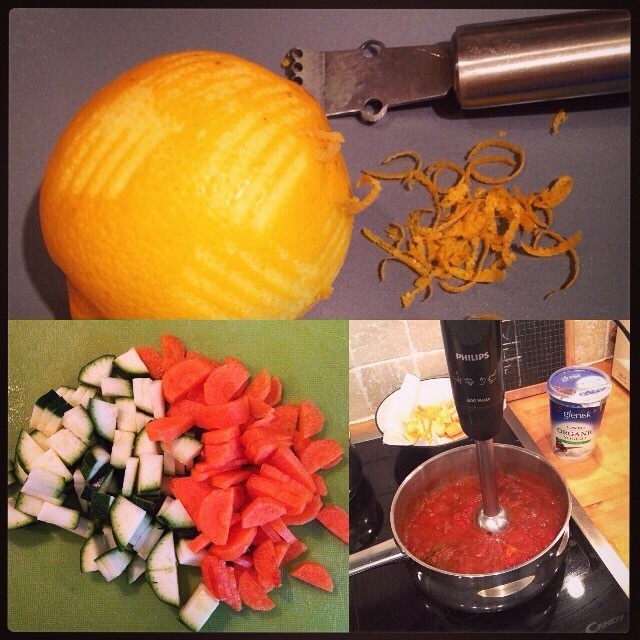 Get your lemon zest done now too. Quick! The kids’ tv show is nearly over and you set up Netflix not to automatically play the next one in a fit of good parenting. Move the pan off the heat and blend the tomato sauce. I really recommend a stick blender in your kitchen gadget arsenal. 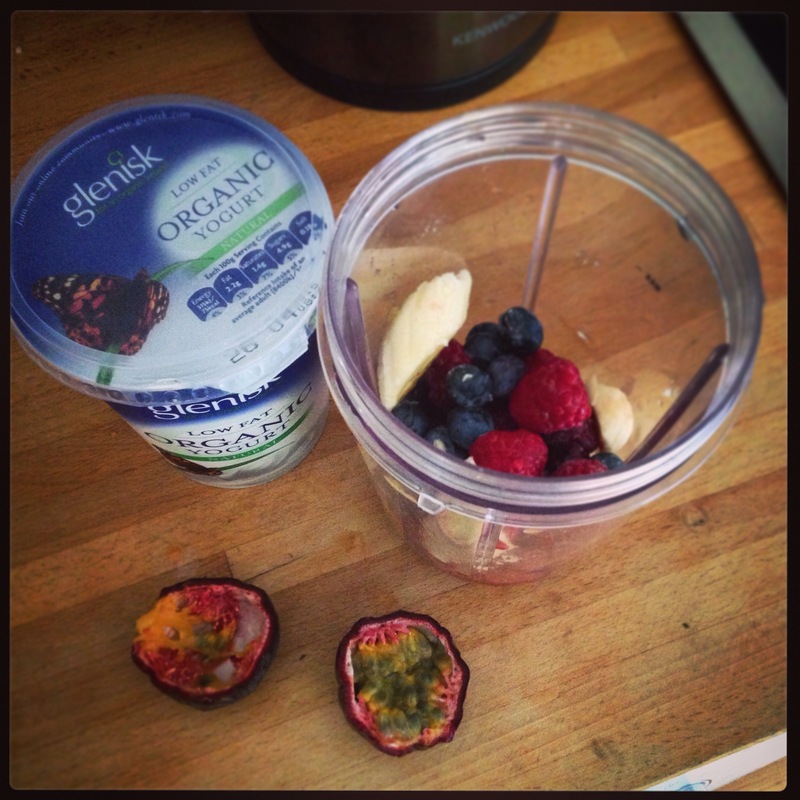 Put it back on the heat, add your veggies along with the Glenisk yogurt and lemon juice. Let this simmer gently for 20 minutes. Add the cooked paneer, Glenisk creme fraiche and lemon zest, and simmer for another 5 minutes. Ta-da! Done. Toast the cashew nuts on a dry pan for a few minutes. Keep a really close eye, they can burn very easily. Now, in case you think “ah here, I’m never going to get through all this lark the kids will be all over me looking for their dinner” I like to chop up extra veggies and just leave them on the side as if they’re an ingredient, and then, just watch them disappear. They sneak in and grab them, thinking they’re hilarious. Joke’s on you kiddo, you just ate raw veggies. He thinks he robbed these from me. Serve up your curry on a bed of brown basmati rice with a sprinkling of coriander and the crushed up toasted cashews scattered on top for a protein boost. I made an extra serving of yogurt with some dried mint and more lemon zest mixed in. 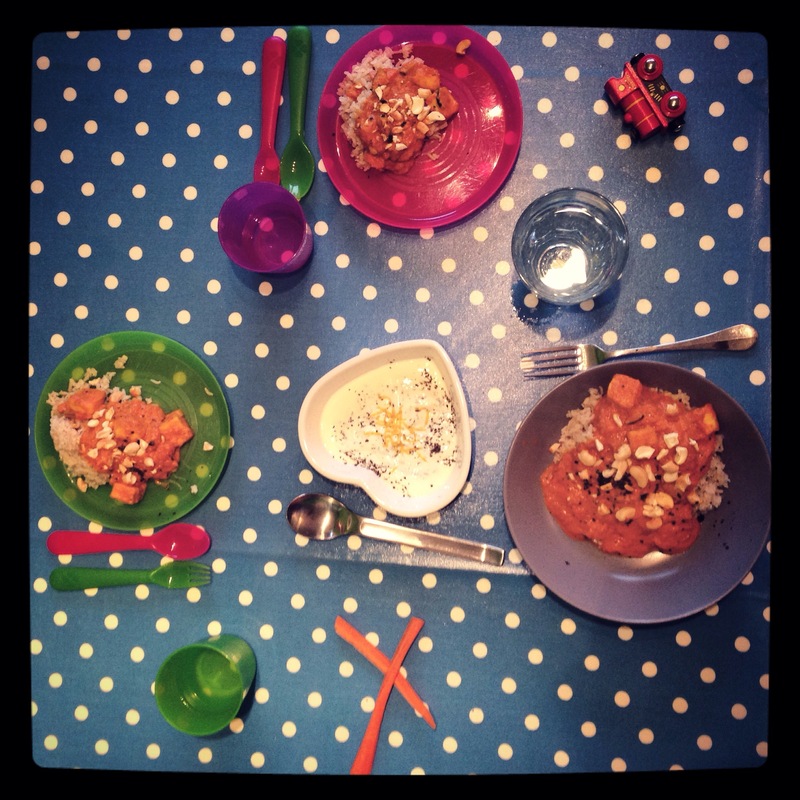 My kids are generally ok with a mild curry, but I often add yogurt to their dinner just to cool the temperature when they can’t wait to get stuck in. Hungry after a good run about outside. During dinner prep we even managed to make a bit of dessert. 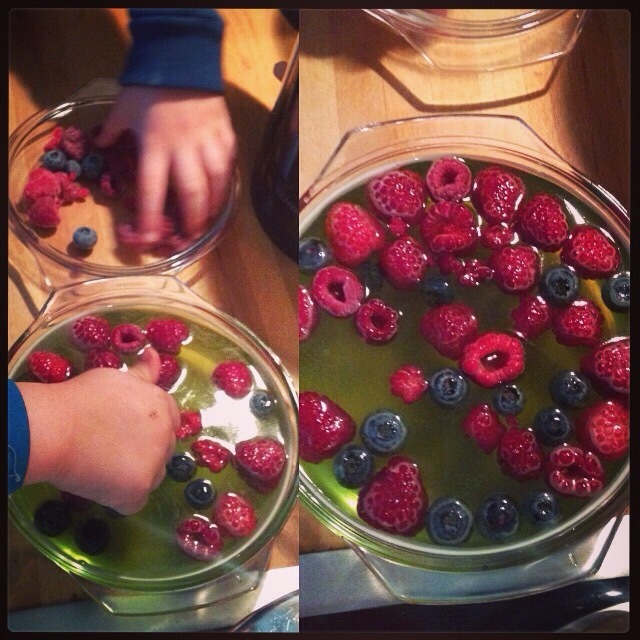 Lime (veggie) jelly with raspberries and blueberries. I stuck it in the freezer so it would be ready after dinner. The colour of the fruit ran so it wasn’t as pretty after. Never fear, it was eaten, but we had run out of yogurt to serve with it. < Who needs hamsters, we have Hexbugs! This looks delicious. 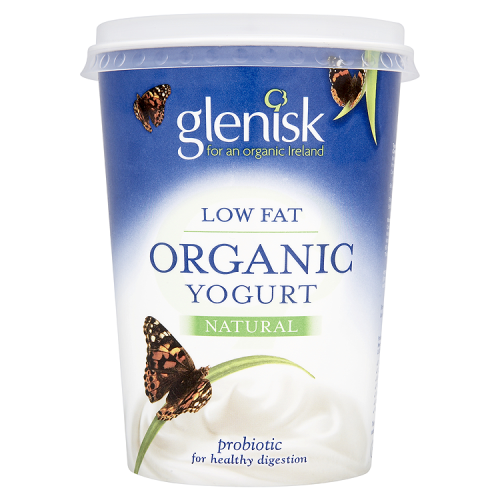 I’m already sold on Glenisk. And we generally have three types of their yoghurts in our fridge at any one time as Mammy and Daddy aren’t dairy free and one kid has goat’s yogurt. 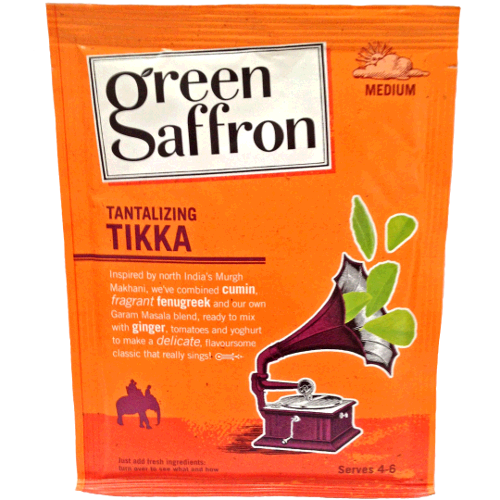 I must try the Green Saffron mix, sounds fab!